One of the main aspects of an excellent blog is its community. To build a community you need to make visitors comment on your blog posts. Apart from that, you should have all the proper commenting features. In today’s article, we will focus on the best WordPress Comments plugins. If you are using WordPress, you should already know the native comment system lack features. They can work pretty well, but you want the best, right? That’s where we cover you and list the best ones out there. We all love great content. Without any comments, it sometimes feels that all the hard work is wasted. But, you don’t have to feel disheartened as there might be an issue somewhere else? The visitors might be finding it hard to comment on your articles in the first place. For example, it might take too many steps for the visitor to post a simple comment. This can lead them to shy away from commenting at all. By using WordPress Comments plugins, you will always have the best possible way of handling the comments. The best way to see this is to provide the visitors the best possible experience when they try to comment. If they find it too difficult or lacking appeal, they will move forward without bothering to comment. Also, your article should have a proper call to action to make them share their comment. JetPack is an amazing package of plugins that let you do just then a simple commenting plugin. If you are using JetPack for some other reason, then you might also want to try its comments plugin module. However, don’t expect too much from the plugin as it gives you just a better version of the “core” WordPress commenting experience. Then, why we are recommending it? Because it gives you the ability to overhaul your basic WordPress commenting system. Moreover, readers don’t have to log in to comment. They can simply put their name and email address to comment, giving them the ability to leave a comment easily. They can also opt to receive an email notification if someone replies to their comment. However, the only con of using Jetpack is its bulky package which can slow down your website. Now instead of enhancing the comments section what if you want to disable it altogether. Disable Comment WordPress plugin allows the admin to globally disable comments for the posts, pages, and attachments. The plugin can also disable all comment related fields from your website. It is worth noting that the plugin won’t work for selectively disabling comments on certain pages or posts while leaving others available for comment. Either you complete disable comments from your website or leave it as it as in the default state. We love Disqus. It is an excellent WordPress comments plugin that offers amazing out-of-the-box setup and great aesthetics. It is also easy to setup, and you can configure almost every aspect of the plugin the way you like. Some of the key features include easy setup, great reading experience, asynchronous loading and much more. This comment plugin for WordPress is also feature-rich, and it fits right into your website design. Setting up the plugin is easy, and it won’t take much of your time. The design is modern, and visitors will find it good enough for comments. To ensure that the comment section looks good, nested comments are supported out of the box. However, making a Disqus account is much better as it gives you the option to follow others. The only downside is that it is mandatory to login into your one of your supported accounts before you can comment. This can be deterred to some of the readers, but it is a good thing as it wards off spam. Facebook comment is another great option for your website. It is known to everyone how popular Facebook is. You will give all the Facebook users a simple option to comment without any difficulty. It is also easy for the readers to tag their friends. However, there is one big con to using facebook comment plugin. There is no way you can audit or monitor the comments, and that can spell evil on your webpage. Setting up facebook comment plugin is easy for tech-savvy people. All you need to do is created an FB App ID, and you are good to go. It is also customizable which means that you enable/disable it any page you like. Other customizable features include changing font-size, text color, position and font family. If you are looking for something similar to Disqus, then wpDiscuz is your best best. It is a comment system powered by AJAX real-time system. This WordPress comment plugin is compatible with all the major plugins out there, and you won’t have any issue whatsoever. It is also feature-rich and you will have full control of the comments and will be able to moderate it accordingly. For example, you can disable/enable comments on pages or posts. Other key features of the plugin include complete responsive design support, modern design, social network login plugin integration, and much more. Subscribe to Comments Reloaded WordPress plugin allows commenters on your website to sign-up to get email notifications about subsequent entries. If you wish to expand your email list by leveraging the commenting functionality of your site, then the plugin will come in handy. With the plugin installed on your websites, a full-featured subscription manager will be integrated into your site which users can use to subscribe or unsubscribe to individual posts. Furthermore, the admin has the option to implement a double opt-in mechanism which will require the user to confirm their subscription. Postmatic is one of the unique commenting plugins for WordPress sites out there. It is a plugin that lets you simply comment on a post/page by using email communication. So, why would you use it in the first place? Because it also acts as an opt-in plugin which means that readers share their email while commenting. However, this doesn’t mean that readers cannot comment on the site. They still can leave comments below blog posts. Email commenting is an additional feature. The ability to comment without visiting the website is a great feature because it gives focus on thoughts and sharing a valuable opinion. Other users can also reply by using email. Also, the plugin is smart enough to stop the subscriptions if it notices that a lot of replies are coming in. One of the issues with commenting on WordPress blogs or posts is that by default there are no means for the user to delete or edit their comments once they have hit enter. However, with “Simple Comment Editing” your users will get the option to edit or even delete their comments. The plugin is super simple to use. All you have to do is simply install it, and from that moment onwards users will be able to edit or delete their comments without any hassle. You too will not have to meddle around with any settings as well. However, some advanced customization options have been thrown in in case you want to use them. The best bit is that the plugin is super easy to use and implement. All you have to do is just install the plugin, and it will handle all the rest. It will load comments when necessary, help reduce HTTP requests, and also enable lazy loading for Gravatars. Want to make your WordPress website comment section filled with more details about the person commenting? Then WP Advanced Comment is an excellent plugin for the purpose. It is an easy to use comment system for your WordPress site that comes with a fully featured drag and drop custom fields builder for comment forms. The plugin allows you to insert custom fields into your comment section including text, text area, radio buttons, checkbox, drop-down menus, emails, HTML codes, and much more. This is the perfect plugin to gain complete control over your site’s comment section. With over 500+ sales, Commentator is a feature-rich WordPress comment plugin. It is powered by AJAX which means that comments are loaded without completely reloading the page. It is simple, yet powerful plugin that is completely customizable. It comes with two themes: Metro and Dark. 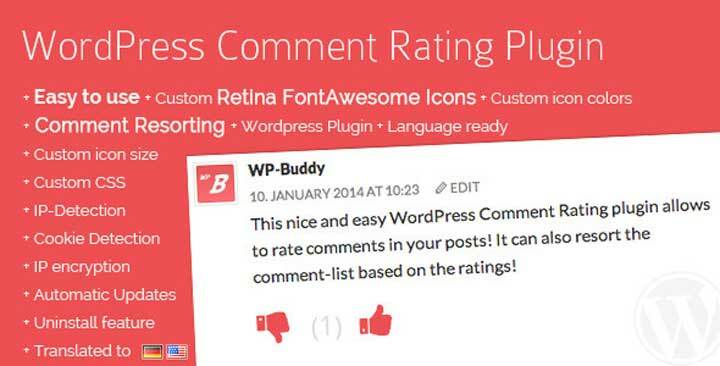 This WordPress commenting plugin can be used with other plugins including Users Ultra, BuddyPress and others. The visitors can do social sign in, upvote and downvote comments and also sort them if needed. As an admin, you have the full control over the moderation of the comments. Also, you can customize the colors and icon according to your liking. If your comment section is too long, you can also add Ajaxified pagination. Overall, a great plugin which is easy to install and manage. If you are already using an awesome WordPress comment plugin, but lack rating, you can use WordPress Comment Rating. It is a simple plugin that lets you add a rating, color, size, and much more. It is also compatible with the latest WordPress. We recommend this plugin for the sole purpose of how easy it becomes to add rating without completely replacing your current comment system solution. Some websites might want to integrate Facebook deeply into their website. This can be done by Facebook comment Plugins for WordPress. It is a package of 10 plugins which also include two dialogs display. By using this plugin for comments, you will be able to integrate not only Facebook comment section, but also add other Facebook-related widgets, like buttons and much more! We recommend this plugin to anyone who is looking for a complete package to integrate Facebook into their website. You can also check the demo to know what it has to offer. DeComment is our first paid WordPress comment plugin. It is a fully customizable plugin which can be installed in just simple two steps. The overall design of the plugin is modern and sleek. This means you can integrate the plugin into your modern theme without any issue. Also, the theme is completely compatible with other plugins. By using the plugin, your comment system will be modernized by a lot of factor including voting system, badge system, media attachment, and much more. The plugin is also multilingual which means that you can use it whenever you want. The settings panel is also easy to use and will let you control every aspect of your website’s comment section. Furthermore, you can set notification site-owner. The plugin is affordable, and you only need to spend $50 one-time purchase fee. It comes with one years of support and updates. Any Other WordPress Plugin for Comments? Today, we covered the best WordPress Comment Plugin present today. We covered both free and paid plugins. There is not so much difference between free and paid plugins listed above, and that’s why we recommend you to try free plugins first. Also, all the free plugins that are listed comes with a PRO version. So, you can just start with a free plugin and then choose a paid plugin accordingly. So, which plugins you are aiming for? Comment below and let us know.